Help your flock acclimate to new members by knowing how to introduce them. 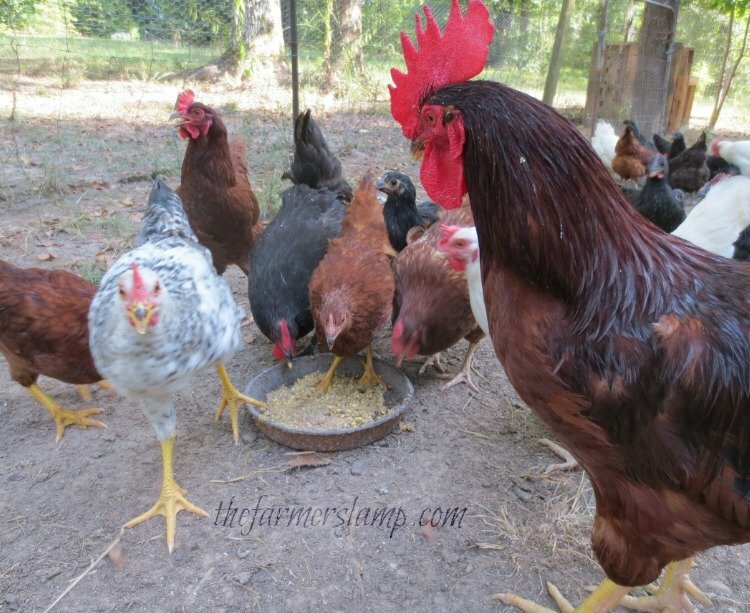 Introducing new birds to your flock can be a stressful time for the new birds, the established flock and for you. Chickens can be very cruel to one another, as least it will appear that way to you. They have a strict pecking order and it’s literally established by pecking. You know the old phrase “hen pecked?” It’s a real thing, and not just for men! 🙂 Knowing how to introduce new hens to your flock can help alleviate some of this stress. If you have the space, put the new birds in a separate yard beside the chicken yard and let them be in view of each other for 2 – 3 weeks. This will give the birds a chance to get used to one another. If you don’t have that luxury, put your new birds on the roost at night when the existing flock is fast asleep and let them wake up together. The next morning, if at all possible, separate your established flock from the new hens. You could free range the established flock or put the new birds into a temporary yard set up inside your pen. This will give your new hens some time to get used to the yard and relax into their new home in peace. After a couple of nights of roosting together, they should be pretty used to one another and the fighting should be minimal. On our farm, I am blessed to have plenty of space. My husband built me a unique setup. I have four side yards that connect to the “big yard” by a gate. On the other side of these side yards is the grow out yard. It is also connected to the main yard by a gate. Each side yard serves its own purpose. The yards on each end are breeding coops. The two in the middle are the rooster yards. These serve as a home for the roosters I keep just for breeding purposes. I keep the roosters separate to help prevent attacks. These yards all share a common fence so the chickens in the big yard can see the biddies or new hens and get used to them. They still do a little bossin’ around, but it has never caused damage to any of the birds. As the young hens grow into maturity, the pecking order will change. If you take one out for setting a nest, the order will change. It will change again when you bring her back in. I just stay out of their squabbles and let them work it out. I introduce pullets when they are three months old. By this age, they’re large enough and established so they are able to handle themselves. I leave the roosters from the same batch in the side yards until I’m ready to butcher. We butcher them at 4 months old. Remember to adjust your feed to account for it be a mixed age flock. Until everyone is 20 weeks old, everyone gets grower with free choice of crushed egg shells for calcium. Since the chicks are kept next to the big flock for so long, there’s hardly any fuss. To introduce them to the coop and flock, I (meaning we) put them on the roost at night when all the birds have gone to sleep. My headlamp has a red light setting on it and I use this so as not to disturb them too much. A sleeping chicken is kinda like a zombie. They’ll let you do pretty much anything to them you want. The pullets are taken from the grow out yard roost and gently, slowly placed on the roost. The goal is to not to wake the other birds. 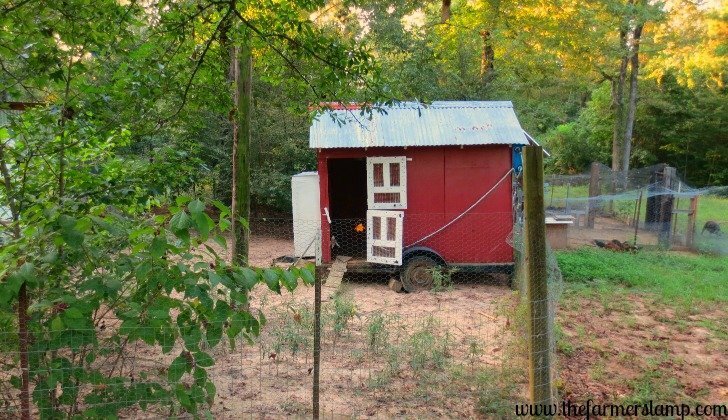 Once they have slept in the coop for 2 – 3 nights, they will know where they live and adjust well. The only problem I’ve had is getting them used to their new roost. They’re so used to being in the grow out coop they want to go back there. Sometimes they want to sleep in the bottom row of nests. To correct this, we went out at night, after they were all asleep and put them on the roost again. We had to do this for three nights before all of them were going to bed on the roost. It’s a little work, but it’s important for them to be sleeping together as a flock. It isn’t hard to introduce new birds, just a little time consuming. Remember, it’s just as stressful for your existing flock to have their order upset. Be sure everyone has plenty to do, eat, and drink and all should be well. This is a good time to offer ACV Tonic (2 tablespoons Apple Cider Vinegar to 1 gallon of water) to everyone. Please share your experiences with introducing new birds to your flock by commenting below or using the Contact Me page. Remember, I am here to help, so always feel free to contact me with your questions and concerns.